Trader Joe's Vinas Chilenas 2008 Reserva Sauvignon Blanc - crisp, light, tart-sweet. 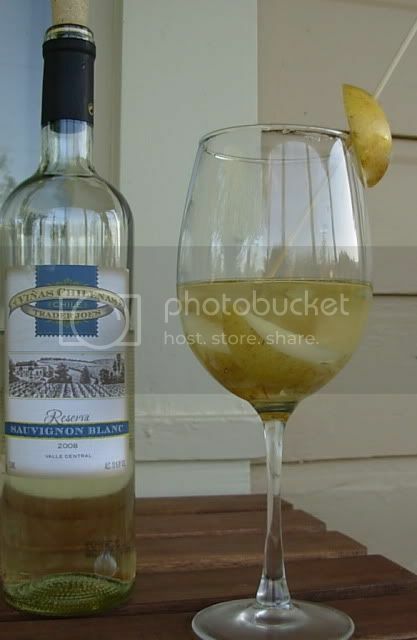 For the full experience, slice an Asian pear (or a Bosc) into a glass of this palest-straw colored wine - chilled for an hour or so - and let them enjoy each other's company while the sun sets on one of these hot September evenings. Then fish out each section and crunch into a wine-soaked juicy slice of early autumn. Trader Joe's Vinas Chilenas 2008 Reserva Sauvignon Blanc. 13% alcohol. Product of Chile. $2.99 at Trader Joe's.